"I'm just a guitar player"
Issue 321 of Guitarist magazine published a huge tribute feature to Les Paul, who died 13 August 2009. Spanning his early life, musical and technical achievements, they explored the legacy left by The Wizard Of Waukesha. A little under six months before his death, Guitarist editor Mick Taylor was lucky enough to speak with Les from his home in New York. Some of the information was used in the Guitarist feature, but for your reading pleasure, the full transcript is now available for the first time. Les was 93 years old when the interview took place. While his speech had slowed somewhat, his sense of enthusiasm was absolutely unabated. 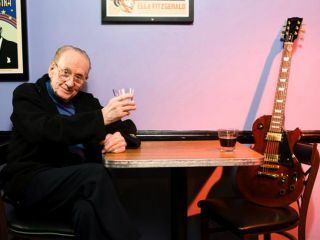 Read one of Les Paul's last ever interviews here.